HMS Surprise - used in the movie "Master & Commander" and "Pirates of the Caribbean"
The Maritime Museum of San Diego enjoys a worldwide reputation for excellence in restoring, maintaining and operating historic vessels. The museum has one of the world's finest collections of historic ships, including the world's oldest active ship, the Star of India. 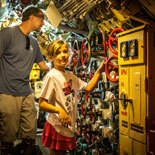 The Maritime Museum of San Diego displays permanent and temporary exhibits on maritime history, commerce and exploration. It stages popular public events such as: The Chocolate Festival, Pirate Buccaneer Birthday Bash, Festival of Sail (Labor Day weekend), and family sleepovers on the Star of India. The Star Of India is in the Guinness Book of World Records as "The oldest sea-going sailing vessel", which is a 1,197-ton iron barque built in 1863. 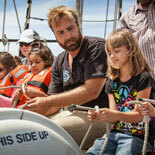 Thousands of school children throughout Southern California visit the Museum each year for a variety of dockside and at-sea educational programs. Premise of the Museum: The history of human achievement is defined in large measure by the historical relationship with the sea. Not only has the sea determined the progress and shape of civilization, our understanding of that relationship and our responsibilities for stewardship of the oceans will determine our future. The role of any maritime museum is translation between human experience of the oceans and our understanding of their nature. This is accomplished through the exhibits. 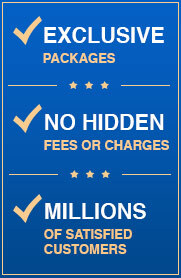 Experience history! 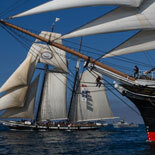 Get your eTickets for the Maritime Museum of San Diego now. 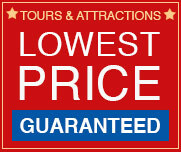 Bay tours have an additional cost and are available on-site only. Daily departures 10:30 am, 11:30 am, 1 pm, 2 pm, and 3 pm. 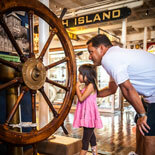 Permanent and temporary exhibits on maritime history, commerce and exploration. 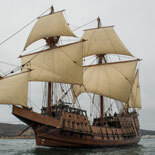 You can board and explore our ships and, on some, even set sail. Hours of Operation: Open most every day of the year (some ships can be closed for special events) 9:00 a.m. - 8:00 p.m. including all holidays. Harbor Dr and Ash St.